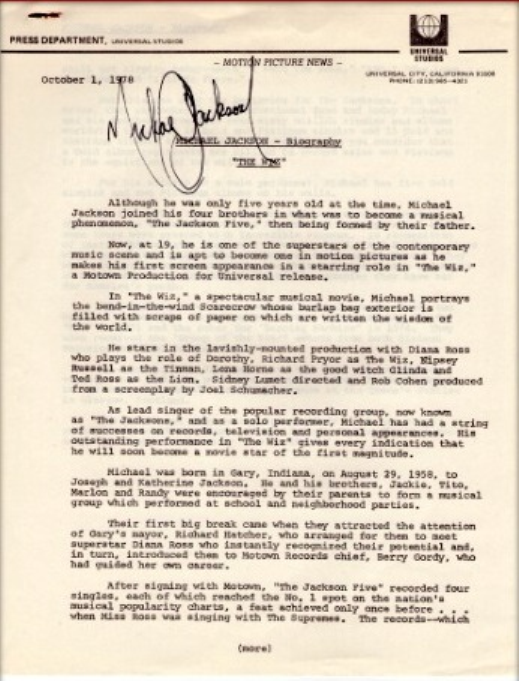 NEVER SEEN BEFORE MICHAEL JACKSON FIRST MOVIE PRESS RELEASE 1978 “THE WIZ” SIGNED! 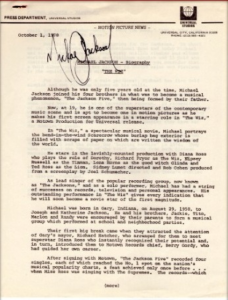 RARE, NEVER SEEN BEFORE MICHAEL JACKSON FIRST MOVIE PRESS RELEASE 1978 “THE WIZ” SIGNED! Also included are the 1979 personal bank book of “Jackson 5” and bank book of the Jackson sister’s! Lee Tompkins was one of Michael’s close friends. Lee is considered to be America’s greatest pencil artist and also has a painting in the White House in Washington DC. A handwritten letter by Lee Tompkins will accompany this special grouping!